London East, UK - If you are lucky enough to live in the UK, chances are you have spent some time inside beautifully restored historic churches full of pristine artefacts. But have you ever been inside one where everything was for sale? Such a place exists and it is called Westland London. Established in 1969, Westland London deals in prestigious and fine architectural antiques from a large Grade I listed former St Michael's Church in Shoreditch, laid out with stunning displays of period chimneypieces, fireplaces and decorative objects inside, with garden ornament and conservatory statuary outside. The essence of history emanates from every inch of the place, not just the merchandise. In most showrooms the line separating stock from background is obvious. Not so at Westland London. The company has built one of the finest and largest collections of antique chimneypieces in the world dating from the fifteenth to the twentieth century. The stock is eclectic, sourced from around the world, and the spaces in the church provide Westland with the scale to display both large and small pieces. In recent years, Westland has diversified its inventory to include a range of architectural and decorative antiques, including lighting, furniture, garden statuary and objets d'art. A fireplace adds integrity to a period home. In modern interiors, a fireplace provides focus and allure. In period homes, uniting an antique chimneypiece with a home of the same period, unifies an interior and adds an air of authenticity. Fireplaces come in so many different forms. Westland endeavours to stock a variety and provides complementary accessories. The renowned Paris antiques dealer, Bernard Steinitz the original 'Chineur', was a mentor to Geoff Westland, the founder of Westland. Steinitz' Parisian showroom and especially his workshops, inspired Geoff to provide a service not just to the client, but to the objects themselves, ensuring that pieces are preserved for centuries to come. Westland is now under the control of Maggie Westland, Geoff's sister, who maintains its tradition as a London company with a strong desire to preserve pieces of London's past. Some of the finest objects in its inventory are important relics from a London which is now largely consigned to history books but can still be found at St. Michael's Church and will go on to be given a new lease of life in a different setting. Westland offers antiques shoppers peaceful sanctuary like a sheltered eye in the storm that is East London. So if you are making a day out of a visit, having a complementary destination in mind to pull you through the swirling streets is a good plan. Local intrigues abound but Spitalfields Market stands out. Just a twelve minute walk away, Spitalfields is London's oldest open air arts market yet it has an undeniably modern vibe. Now open seven days a week, its smaller wares offer a natural contrast to the mainly larger pieces at Westland. You can find fashion new & old, all sorts of unique and original art, and a wide selection of interiors at non-London prices. Nestled amongst the border between Shoreditch and the City, creative professionals, hipsters, and international tourists rub shoulders with overworked office drones and important-looking bankers types. This unconventional cross-pollination of characters adds up to an atmosphere that bubbles with life and presents London people watching at its best. Even if you are all shopped out after Westland, the ridiculous diversity of cuisines at Spitalfields are more than reason enough to visit. Wildly popular among the ravenous office lunch crowd, the buzz of the market owes just as much to the food as anything. It is a good bet you will not find a more diverse array of restaurants and food stands under one roof in London. The images show a very few of the many spectacular and historic artefacts and elements that Westland has in stock today. 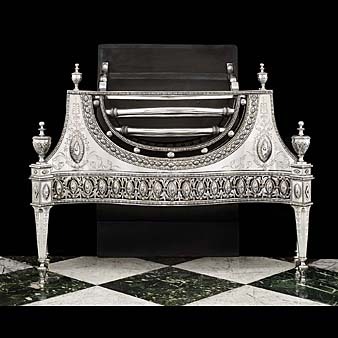 A heavy polished 8ft wide cast iron arched grill by Sir Horace Jones, the designer of Tower Bridge, and made by Cottam & Willmore in 1877 which came from the old Billingsgate Fish Market by the River Thames with the combined arms of the City of London in the centre flanked by the arms of the Worshipful Company of Fishmongers. 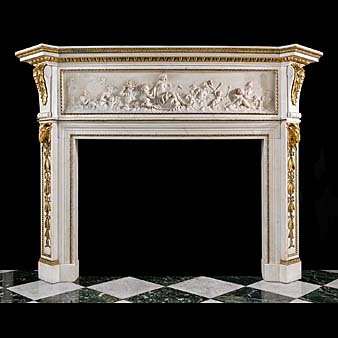 Westland has in stock this rare nineteenth century statuary marble and ormolu (gilt bronze) chimneypiece in the French Regency style with an exquisitely carved marble panel after the famous French rococo sculptor Clodion - who was known for his frolicking nymphs - which was probably acquired during a Grand Tour. The fireplace came from the drawing room of Brook House in Park Lane, London. The carving depicts Le Triomphe d'Amphitrite who, after escaping the attentions of Poseidon, returned on dolphins to become his bride, accompanied by putti, tritons (mermen) and nereids (mermaids). The 'Summer Grate', is believed to have been made very close to Westland's Shoreditch showroom, and is one of four examples still known to exist. This George III polished steel grate is finely etched and embellished in the neo- classical style of Robert Adam, with an ornate front panel which can be removed during the winter to protect it from damage when the grate is in use, and then is reinstated during the summer - hence the name. 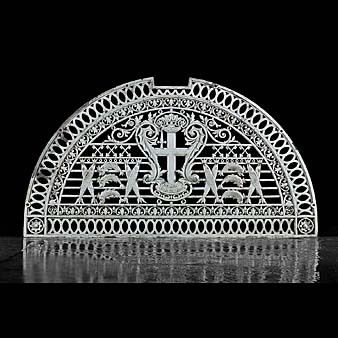 There are two similar grates in Spencer House and one in the V&A made by Henry Jackson of Saffron Hill, Smithfield. "To be in possession of such a rare and fine object is a great privilege," said Maggie Westland. "It would almost certainly have been specially commissioned to complement a grand chimneypiece." 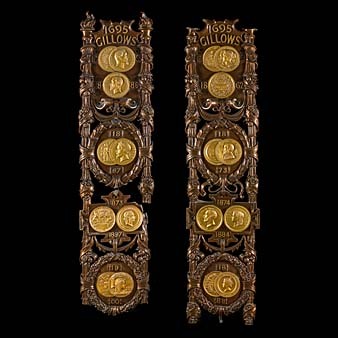 A magnificent and enormous pair of bronze Edwardian Baroque panels made for Gillows of Lancaster, the famous furniture and furnishings company founded in 1730, showing medals awarded to the company at exhibitions from the 1851 Great Exhibition to Paris 1900 and Brussels. They are likely to have been made for either the 1908 London Exhibition or 1913 Ghent. The panels bear medallion copies of the medals that Gillows were awarded at various exhibitions. Westland Ltd is a Salvo Code member. Members give the public greater confidence they are buying salvage and antiques from a safe and responsible source. Look out for the Crane logo. Michael Morel, an American currently living and working in London, has become a regular contributor to SalvoNEWS.